JUSTELLA'S GRANDMA: First flimsy finished this year. First flimsy finished this year. Well the title sounds good. But it has taken me all year to get this flimsy to this stage. 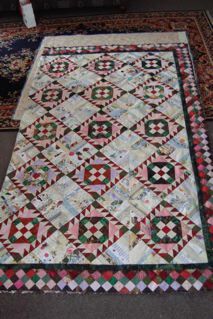 It is so big 80" X 100" that I can't quilt it on my machine so I am thinking I will have to send it to a long arm quilter. I am thrilled to have finish it and really pleased how it has turned out considering some of the ugly fabric that is in it. In the photo it is folded in half as I couldn't find a space big enough. 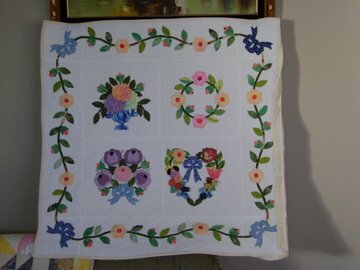 The pattern is from Bonnie Hunters mystery quilt from 2010. Roll Roll Cotton Boll. I've just came across your blog and see your beautiful and big quilt. Will you show it again when it is machine quilted and completely finished, please? Up to now I haven't done such a big quilt...for fear not to be able to quilt it with my own domestic sewing machine.